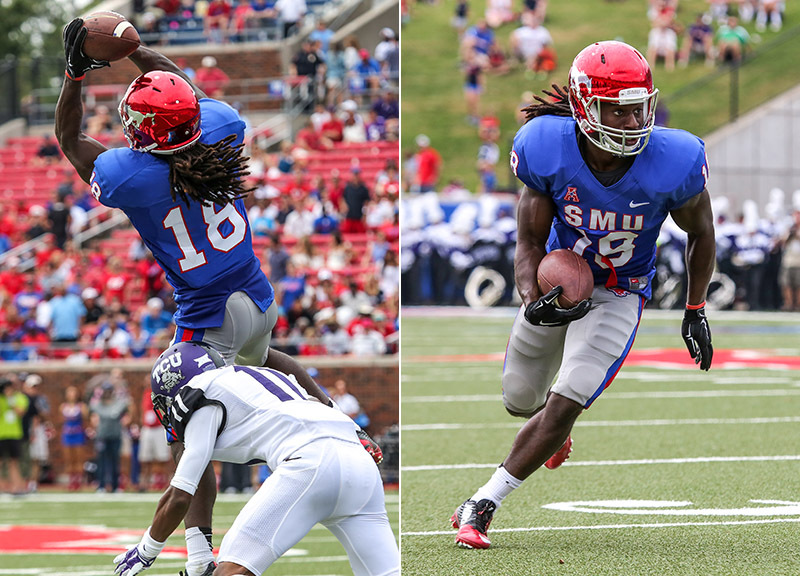 Scenes From SMU's 0-56 Loss To TCU In The Battle For The Iron Skillet. This weekend, area rivals Texas Christian University and Southern Methodist University faced off once again in its annual Battle for the Iron Skillet. But it wasn't much of a battle. Not by a long shot. TCU's 56-0 rout of SMU, now 0-4 on the season, was the most lopsided victory in the 94 meetings the two area teams have played in. With the win at Gerald J. Ford Stadium, the Horned Frogs (3-0) are now the 25th-ranked team in the country in both the AP and USA Today Coaches polls. 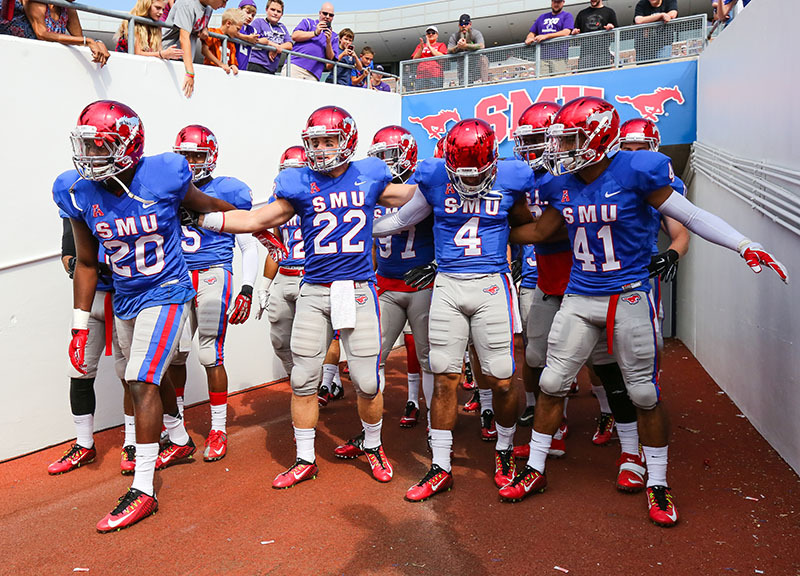 With the loss, the Mustangs continue a free fall as one of the worst FBS teams in the country. “I'm gonna be glad to get out of the Big 12 for a moment and get into [the American Athletic] conference,” SMU's interim head coach Tom Mason said after the loss. The Mustangs have been blown out by three Big 12 teams on the season. The latest was led this weekend by TCU quarterback Trevone Boykin, who threw for 280 yards and four touchdowns, as well as 62 rushing yards and two more touchdowns on the ground. Despite offensive production that totaled 614 yards, 31 first downs and eight touchdowns against the SMU defense TCU wasn't impressed with the team's brand-new, fast-paced spread offense. Whether the team was looking for consistency or just looking to hammer a rival, TCU didn't pull its starters until the fourth quarter after amassing a 49-0 lead. The Mustangs failed to score a touchdown in a game for the third time this season. 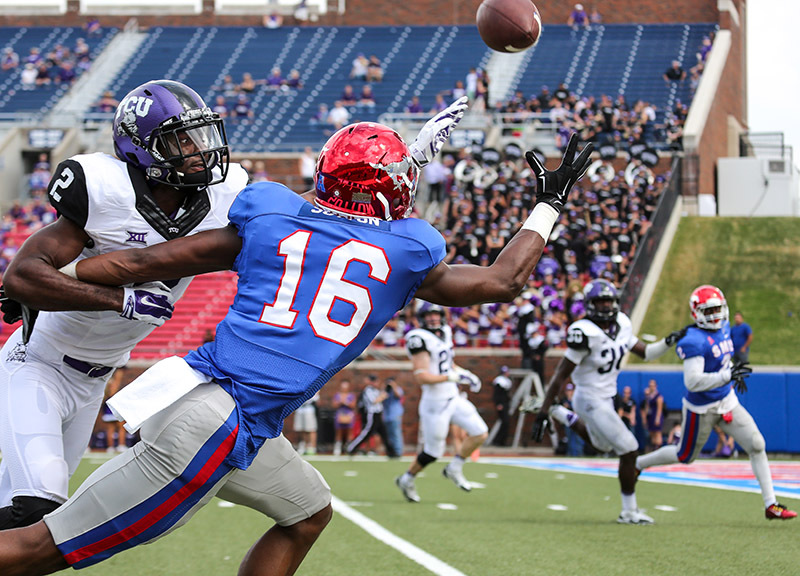 That almost wasn't the case after SMU wide receiver Darius Joseph got up after appearing to have landed on top of TCU defensive back Ranthony Texada, then sprung up and ran down the sideline for a diving score. However, the score was taken away after a review of the play showed Joseph's elbow hit the ground during the initial tackle. 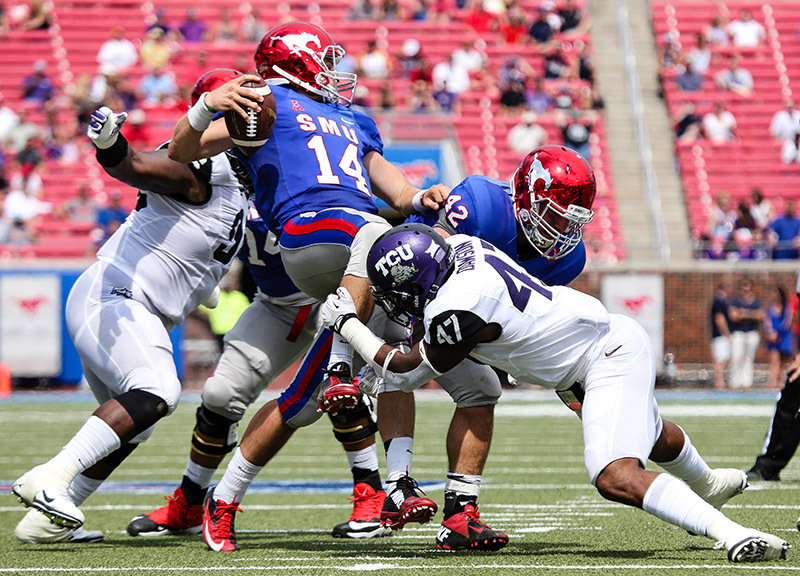 SMU was plagued by the same issues that have been stalling the team all season: The offense gave up nine sacks — the third time this season the team has given up eight or more sacks. 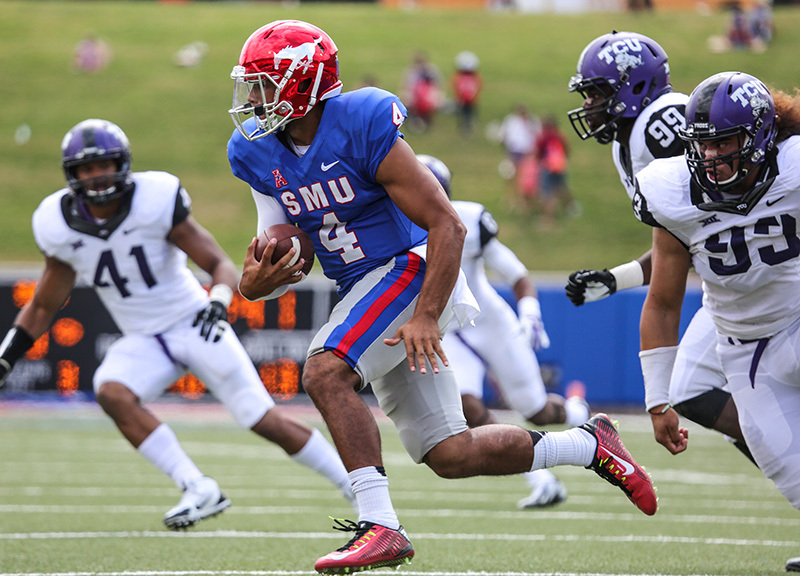 SMU quarterback Garrett Krstich took the blame for the seven sacks on him, citing his own hesitation and need to make quicker decisions in the pocket after his first career start. Krstich also took responsibility for the defensive struggles, as well. One of the few bright spots for the Mustangs came in the fourth quarter when linebacker Derek Longoria blocked an attempted field goal by TCU. The blocked field goal was the second of the second for the Mustangs. 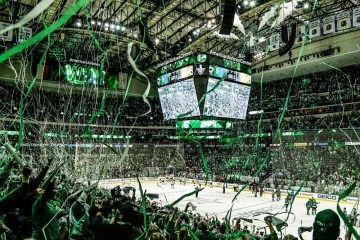 SMU has been waiting for conference play to begin to prove they're not as bad as their 0-4 record would seem to indicate, and their first opportunity to turn the season around comes this Saturday, as the team travels to North Carolina to face American Athletic Conference and 22/21-ranked foe Eastern Carolina University next week. TCU begins conference play as well next week against 4th-ranked Oklahoma at Amon G. Carter Stadium in Fort Worth. 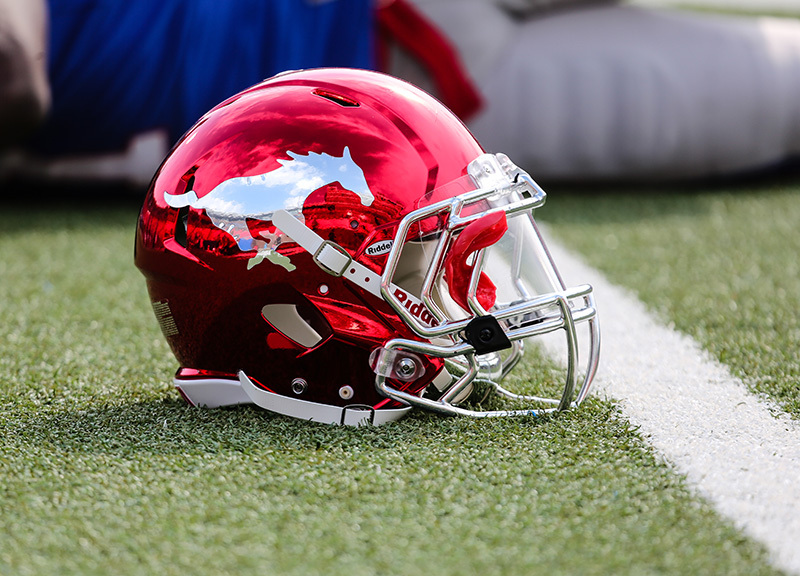 SMU played with brand-new red metallic chrome helmets. The Mustangs' new helmets are also fortified with Kevlar liners to further prevent concussion risks. The Mustangs prepare to enter the field during pre-game pageantry at Ford Stadium against the TCU Horned Frogs in the Battle for the Iron Skillet. 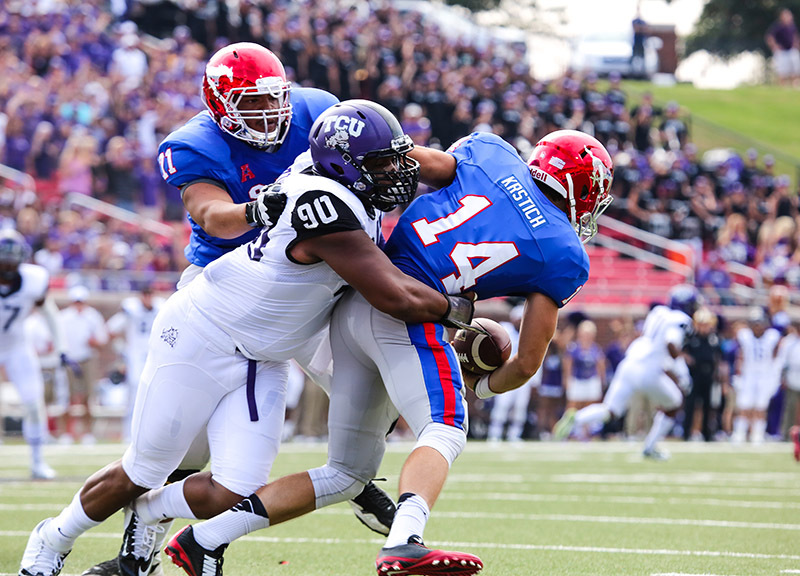 SMU starting quarterback Garrett Krstich (14) is sacked by TCU defensive lineman Terrell Lathan (90). Krstich was sacked seven times by the Horned Frogs defense. 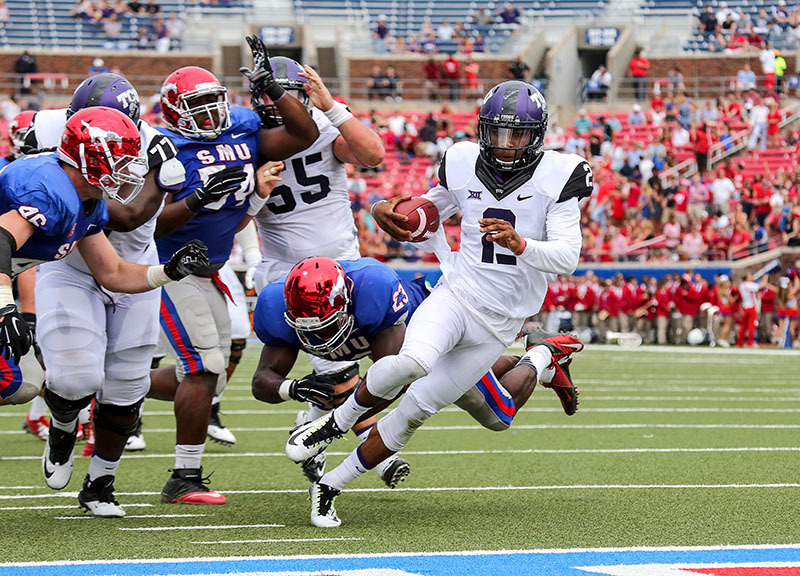 TCU quarterback Trevone Boykin (2) scrambles away from the SMU defense for his first rushing touchdown of the game early in the first quarter. Boykin ran for 62 yards and two touchdowns. 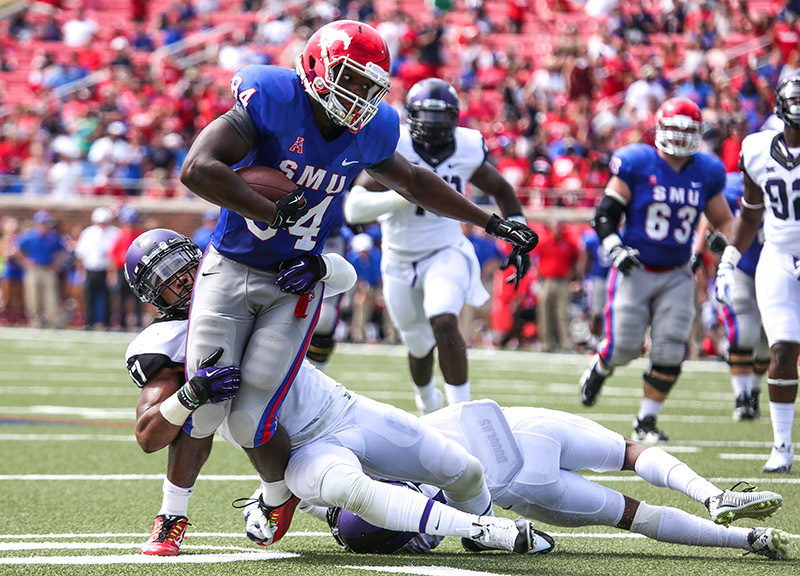 SMU running back Darius Durall (21) is brought down by TCU linebacker Sammy Douglas (35) on a kick return. Durall was one of four kick returners for the Mustangs. 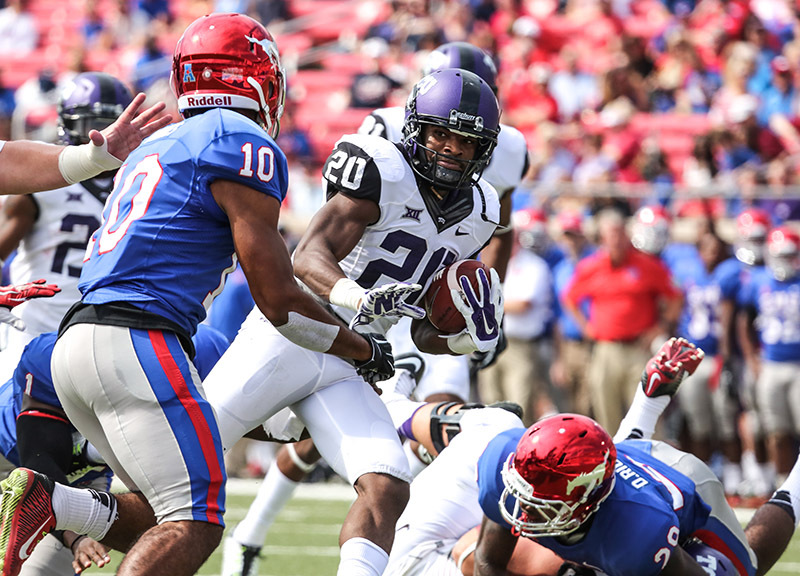 TCU wide receiver Deante' Gray (20) runs past SMU defensive back Ajee Montes (10) in the first half of the Battle for the Iron Skillet. Deante' Gray had six catches for 96 yards and two touchdowns. TCU running back B.J. Catalon (23) jukes SMU linebacker Nick Horton (5). Catalon recorded his first-career 100-yard game with a total of 118 yards and one touchdown. SMU quarterback Garrett Krstich (14) attempts a pass in the first half. 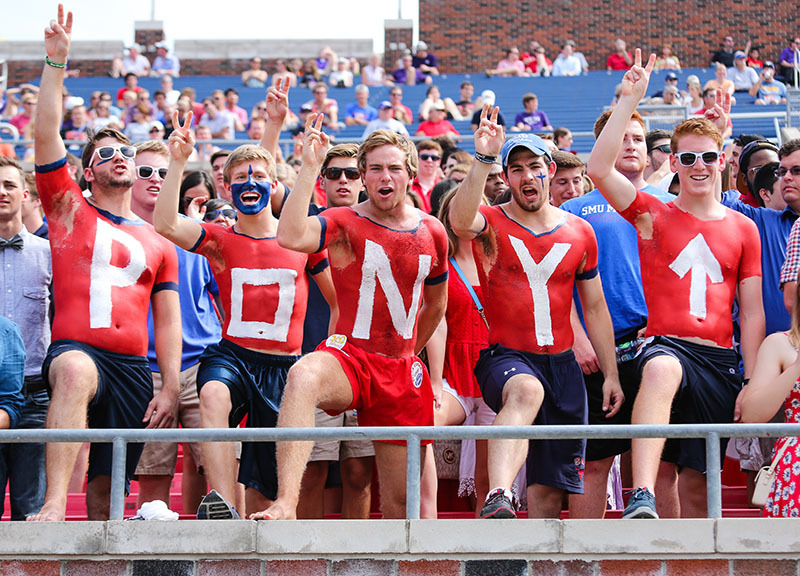 SMU fans cheer on the Mustangs during Saturday's Battle for the Iron Skillet. 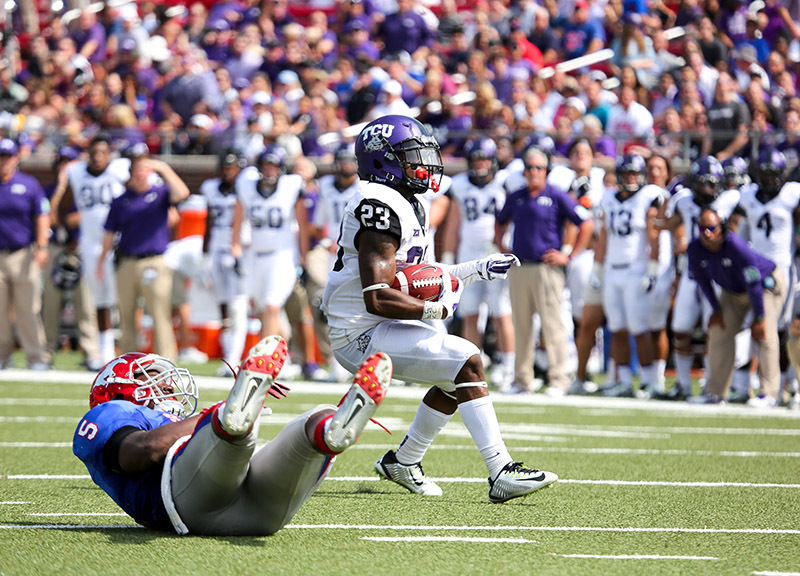 SMU wide receiver Jeremiah Gaines (84) is brought down by TCU linebacker Paul Dawson (47). Dawson had two tackles and one sack in the game. 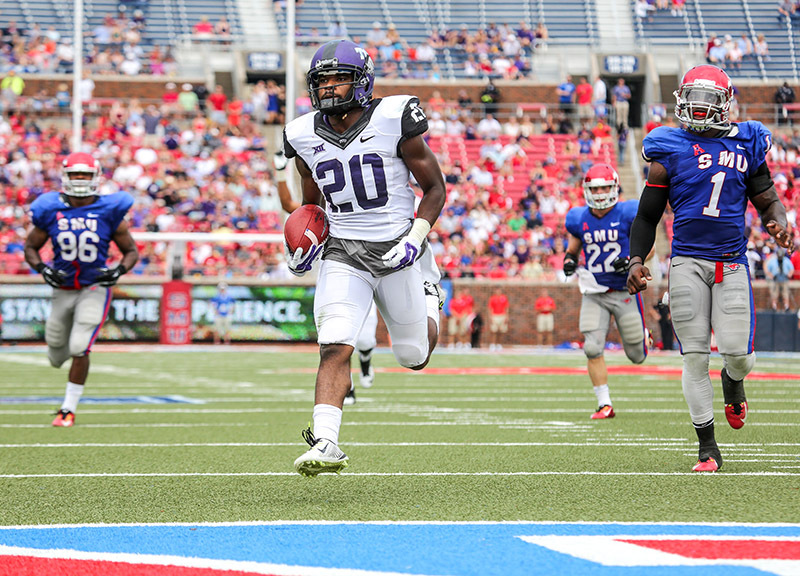 TCU wide receiver Deante' Gray (20) runs away from the Mustangs defense for a touchdown in the first half. 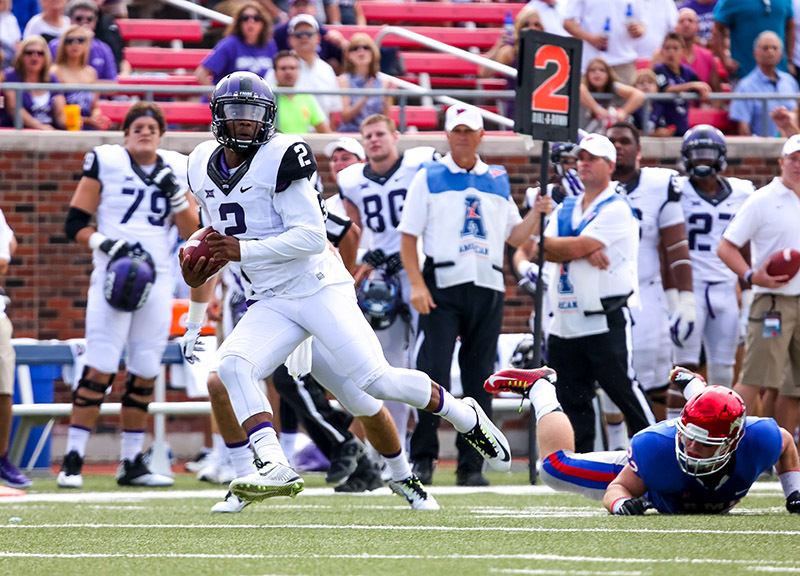 TCU quarterback Trevone Boykin (2) falls into the end zone for his second rushing touchdown of the game. SMU wide receiver Darius Joseph (18) appears to score on a reception after falling on top of TCU defensive back Ranthony Texada (11). 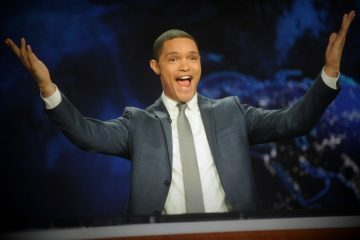 After an official review, the touchdown was called back after Joseph's elbow touched the ground during the attempted tackle. 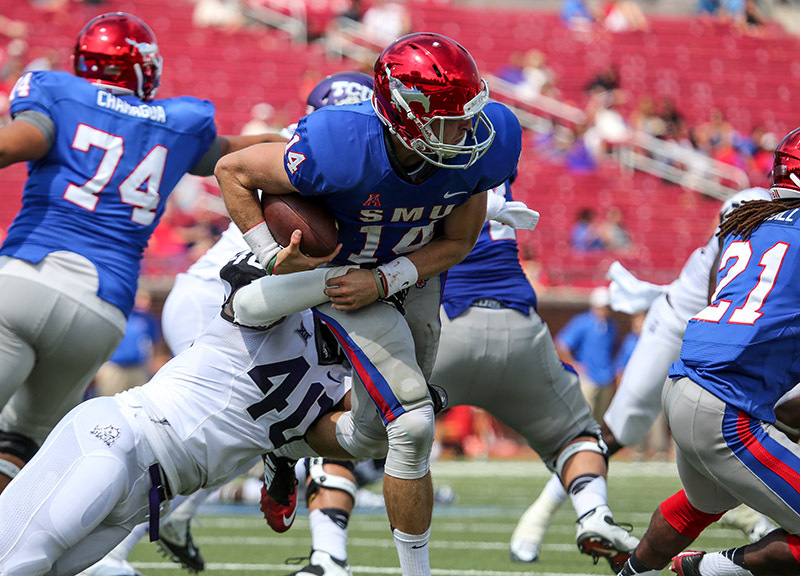 SMU quarterback Garrett Krstich (14) is swept off his feet during a sack by TCU linebacker Paul Dawson (47). 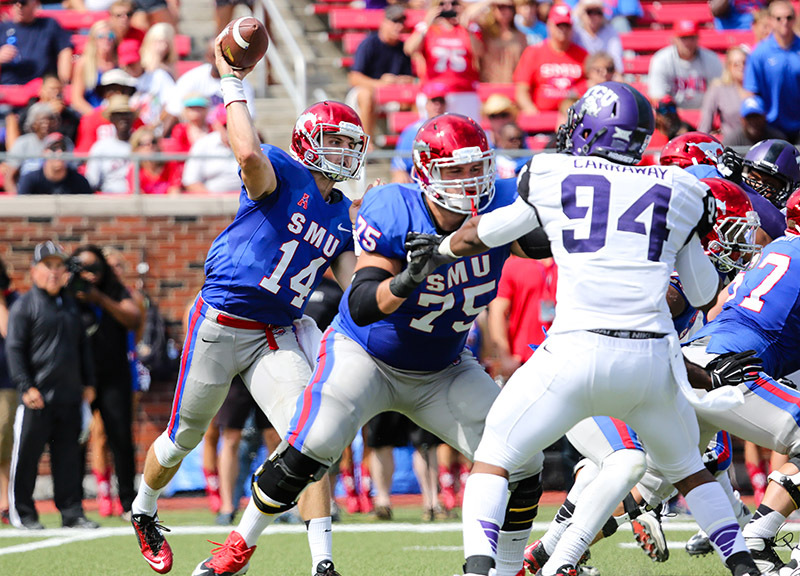 SMU quarterback Garrett Krstich (14) is wrestled down by TCU defensive lineman James McFarland (40). 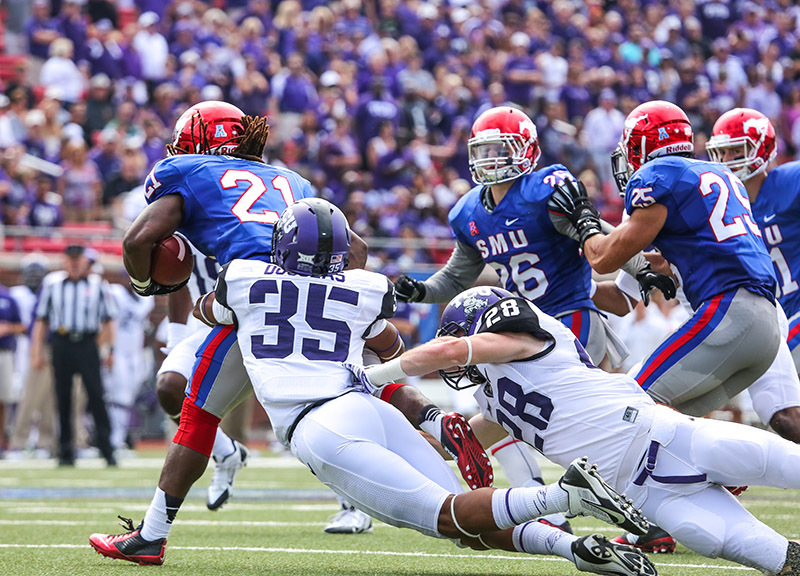 SMU quarterback Matt Davis (4) scrambles away from TCU defensive lineman Mike Tuaua (93) for a first down. Davis stepped in for Krstich during the fourth quarter. 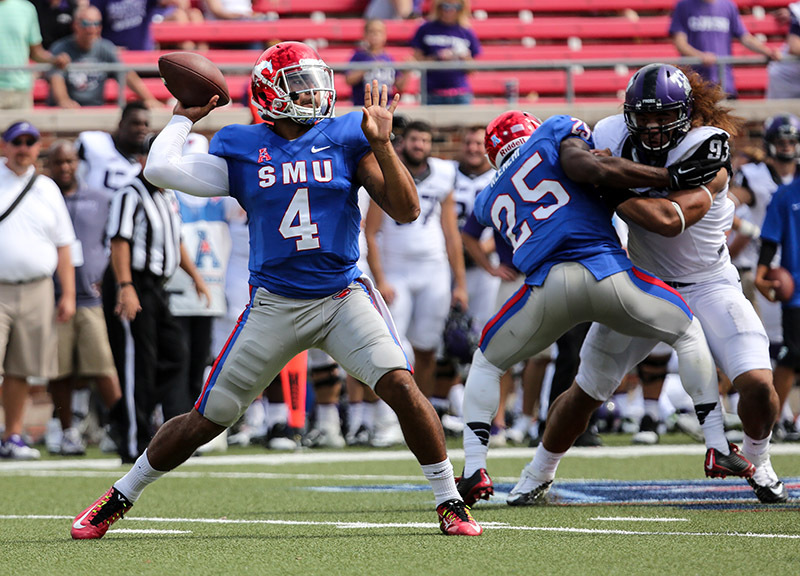 SMU quarterback Matt Davis (4) attempts a pass during the fourth quarter. Davis led the struggling Mustangs offense to the red zone but failed to score as time expired. SMU wide receiver Courtland Sutton (16) reaches for a pass. The pass was incomplete, but TCU defensive back Corry O'Meally (2) was called for pass interference. 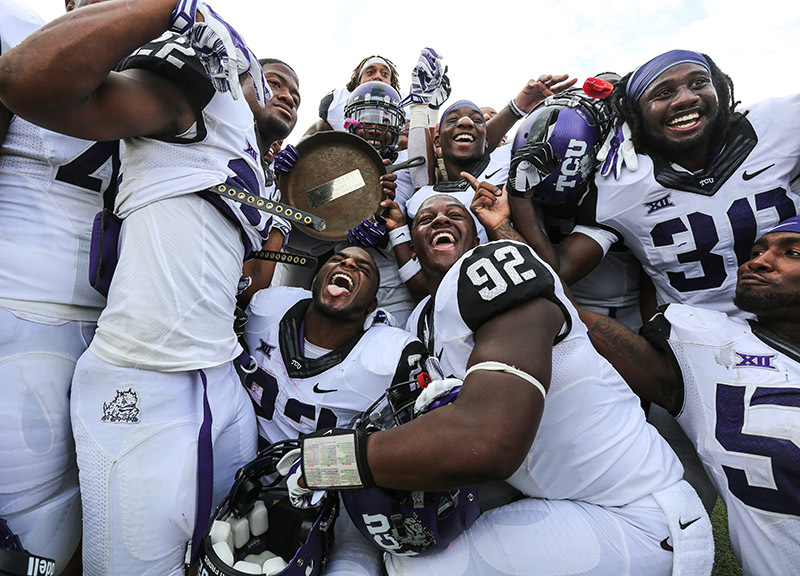 TCU Horned Frogs celebrate their 56-0 victory over the SMU Mustangs with the Iron Skillet. In the 94 meetings between the two teams this was the most lopsided result. Previous ArticleThings To Do On Monday, September 29.